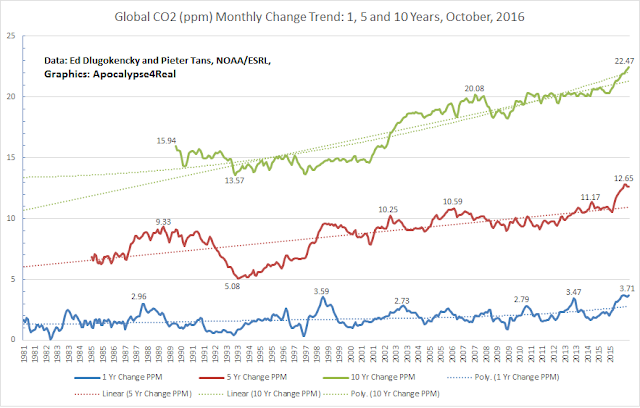 Global CO2 hits new record monthly high during October, 2016 and record year to year and ten year monthly increases. On December 5, NOAA/ESRL released the global monthly CO2 average for October, 2016. It set a new record high for the month of 402.31 ppm. Compared to 2015's 398.60 ppm, the one year change was an increase of 3.71 ppm. This reading may adjust for some months into 2017, but not enough to make it a less sobering sign that human and natural impacts on CO2 levels continue to push us toward climate changes that increase the possibility of cascading feedbacks. The 3.71 ppm increase is the highest monthly jump over the same month in the prior year for any monthly comparison in the NOAA/ESRL observations. It beat out August-October, 1998, June to August, 2013, and every month of 2016 which each had a year to year increase over 3 ppm. The monthly CO2 trend since January 1980, portrays the increasing rise through the years, passing 340 ppm in May, 1980, 360 ppm in January 1995, piercing 380 ppm in April, 2005, and smashing through 400 ppm in March, 2015. What is troubling is that this trend of 20 ppm markers is coming with slowly increasing frequency. There are also troubling hints, that acceleration of the CO2 increase may be occurring in the natural system in addition to human emissions. We may not know how much natural emission rates may be increasing for several months into 2017, until the recent El Nino impacts on the carbon cycle subside. One way to illustrate these accelerating monthly increases is to compare, not only the monthly increase to the prior year, but also over the five year and ten year periods. 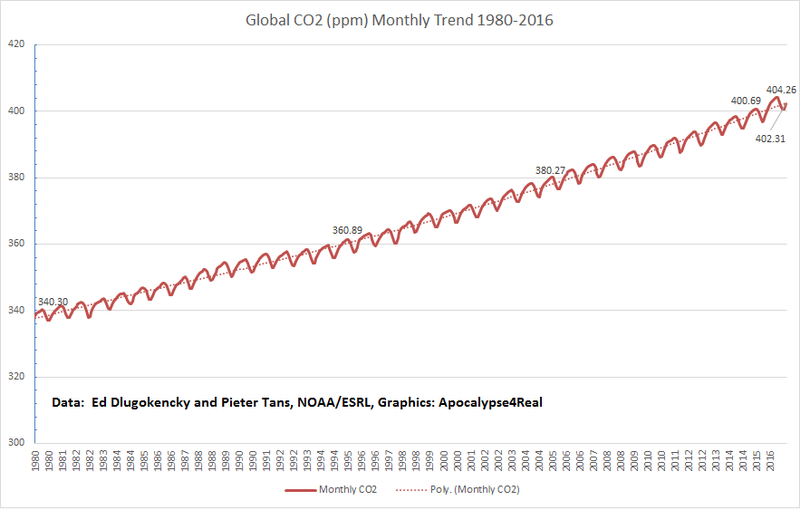 In other words, the CO2 increase between October, 2016 to the same month in 2011 and then 2006. The following graphic illustrates those changes. The bottom (blue) line is the monthly change in CO2 ppm from the prior year. The middle (red) line is the change of any month compared to the same month five years earlier. The top (green) line is the monthly CO2 compared to ten years before. The year to year monthly change reflects peaks that have often occurred as a delayed response to El Nino conditions, however that may be changing in a worrying way. However, that is a topic for another post. The five year monthly change reveals a more apparent accelerating growth in atmospheric CO2. In September and October, 2002 we experienced the first two months with a five year increase of more than 10 ppm. from May, 2005 to April, 2008 we experienced 32 of 35 months with changes of more than 10 ppm over the same months five years before. Commencing with February, 2013 we have not experienced a month with less than 10 ppm change from five years before. In fact, we witnessed the first months above an 11 ppm change during July to September, 2014. We returned to changes of more than 11 ppm in December, 2015, and have not dropped below since. What is more troubling is that beginning in March, 2016, we have experienced more than a 12 ppm change over the same month 5 years before. The ten year change started with a high, 15.94 ppm change in January, 1990 compared to January, 1980. That would remain the highest 10 year change until it was tied in December 2001, and broken in March, 2002 when we exceeded 16 ppm for the first time. Increases in the ten year change rate came in quick succession passing 17 ppm in September, 2002, 18 ppm in May, 2003, and 19 ppm in January, 2006. The first ten year increase above 20 ppm occurred in September, 2007. Since October, 2012, we have not gone below a 20 ppm change compared to ten years before. We are now experiencing another acceleration, passing through 21 ppm change for the first time in December, 2015 and smashing through 22 ppm in August, 2016. 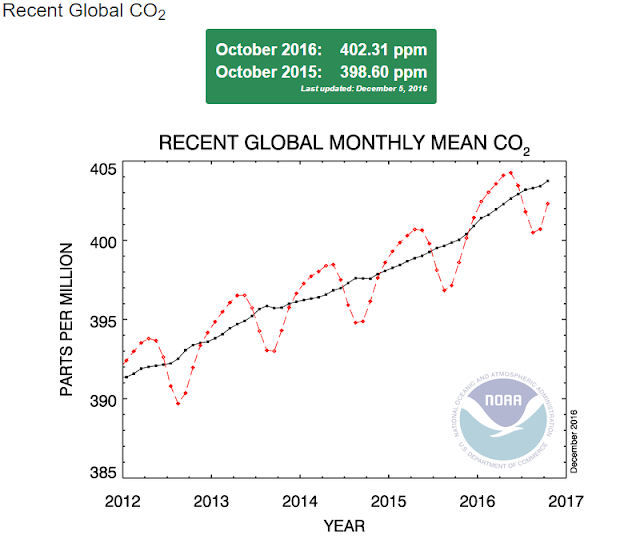 In summary, we have hit the highest one year global CO2 change in October, 2016, of 3.71 ppm. We hit the highest five year change of 12.83 ppm in August, 2016, and stand at the highest ten year change of 22.47 ppm in October, 2016. 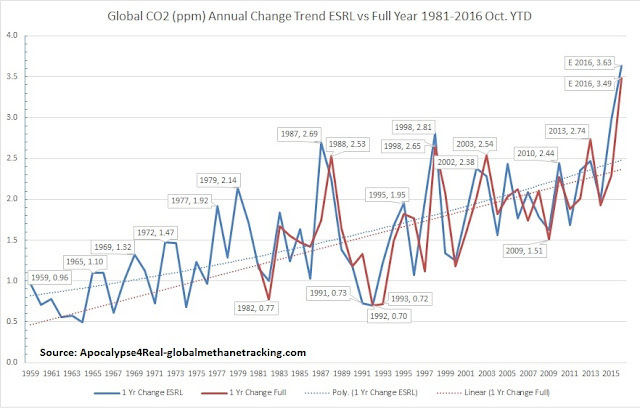 NOAA/ESRL summarizes global CO2 change as annual growth rates. It uses a methodology that compares the December/January average to that of the prior year. That is depicted in the first column in the following table. Additionally, another methodology that could be used is to average the monthly change for all months in a given year. This does depict the annual change differently but captures the average of growth rate changes within a particular year. Here is the table for comparison, and then a chart. In the chart above, the blue line represents the NOAA/ESRL annual change. While the media initially portrayed 2015 as the first year above a 3 ppm annual change, in the end, that was not the case, with the final growth rate of 2.98 ppm. In 2016, tearing through an annual growth rate of 3 ppm will not even be in question. What is troubling is how large a jump we will experience. 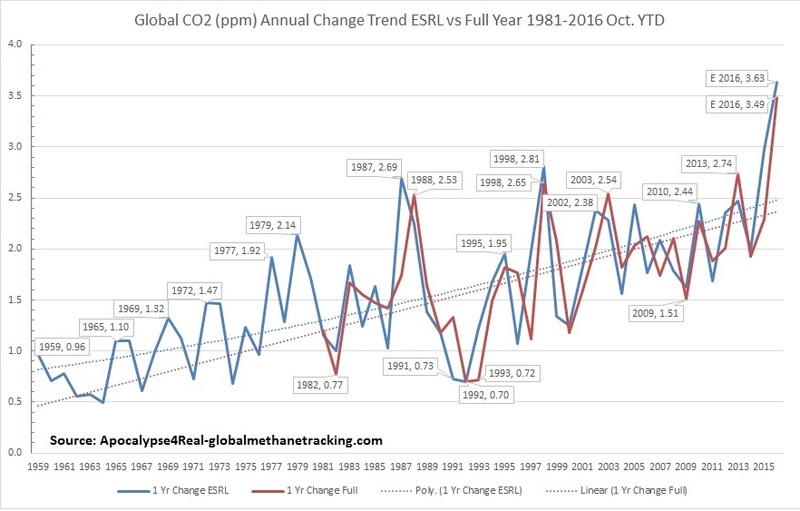 Using the NOAA/ESRL methdology of two months averaged compared to the prior year, on a September/October basis we will see an estimated 3.63 ppm annual growth rate. Using the annual average of increases approach, it is estimated to be 3.49 ppm. In reality, these numbers are conservative, since November, 2016 through January, 2017 will have higher concentrations given the annual cycle. Given that impact, the NOAA/ESRL annual growth rate has a good probability of being above 3.7 ppm for 2016. We will know for sure in a few months.